In this chapter we cover the non-economic and non-control terms in the term sheet. Some matter, some don’t, and context matters a lot. Hopefully we’ll give you plenty of it to use in your negotiation with your venture capitalist. Up to this point we’ve been exploring terms that matter a lot and fall under the category of economics or control. As we get further into the term sheet, we start to encounter some terms that don’t matter as much, are only impactful in a downside scenario, or don’t matter at all. This chapter covers those terms, which include dividends, redemption rights, conditions precedent to financing, information rights, registration rights, right of first refusal, voting rights, restriction on sales, proprietary information and inventions agreement, co-sale agreement, founders’ activities, initial public offering shares purchase, no-shop agreement, indemnification, and assignment. If we’ve worn you down by now and you’ve bought Venture Deals: Be Smarter Than Your Lawyer and Venture Capitalist, thank you. If not, what are you waiting for? Yup – many VCs are control freaks. And they love control terms. In this chapter we tell you which ones matter, why they matter, and what you should pay attention to. We also give you some advice on what is worth negotiating hard for, as well as what you shouldn’t worry about too much. The terms we discussed in the preceding chapter define the economics of a deal; the next batch of terms define the control parameters of a deal. VCs care about control provisions in order to keep an eye on their investment as well as comply with certain federal tax statutes that are a result of the types of investors that invest in VC funds. While VCs often have less than 50 percent ownership of a company, they usually have a variety of control terms that effectively give them control of many activities of the company. In this chapter we discuss the following terms: board of directors, protective provisions, drag-along rights, and conversion. We are now getting into the juicy stuff – economics of the deal. When discussing the economics of a VC deal, one often hears the question “What is the valuation?” While the valuation of a company, determined by multiplying the number of shares outstanding by the price per share, is one component of the deal, it’s a mistake to focus only on the valuation when considering the economics of a deal. In this chapter we discuss all of the terms that make up the economics of the deal, including price, liquidation preference, pay-to-play, vesting, the employee pool, and antidilution. In addition to defining and describing each terms, we give extensive examples in this chapter. Grab a beer – take your time – there’s a lot here. Almost all of the terms also have a special bonus “The Entrepreneurs Perspective” from our good friend Matt Blumberg, the CEO of Return Path. Chapter 3 of Venture Deals: Be Smarter Than Your Lawyer and Venture Capitalist is a transitional one that sets up the next few chapters on Term Sheets. At the end of 2005, we participated in a financing that was much more difficult than it needed to be. All of the participants were to blame, and ignorance of what really mattered in the negotiation kept things going much longer than was necessary. We talked about what to do and, at the risk of giving away super-top-secret VC magic tricks, decided to write a blog series on Brad’s blog (Feld Thoughts) that deconstructed a venture capital term sheet and explained each section. That blog series was the inspiration for this book. The next few chapters cover the most frequently discussed terms in a VC term sheet. Many VCs love to negotiate hard on every term as though the health of their children depended on them getting the terms just right. Sometimes this is inexperience on the part of the VC; often it’s just a negotiating tactic. The specific language that we refer to is from actual term sheets. In addition to describing and explaining the specific terms, we give you examples of what to focus on and implications from the perspectives of the company, VCs, and entrepreneurs. The various terms in a term sheet fall into three categories: (1) economics, (2) control, and (3) everything else. In this chapter we explain what we need by economics and control as we get ready to roll into the meat of the term sheet. In Chapter 2 of Venture Deals: Be Smarter Than Your Lawyer and Venture Capitalist, we cover the basics of the VC fundraising drill. Your goal when you are raising a round of financing should be to get several term sheets. While we have plenty of suggestions, there is no single way to do this, as financings come together in lots of different ways. VCs are not a homogeneous group; what might impress one VC might turn off another. Although we know what works for us and for our firm, each firm is different; so make sure you know who you are dealing with, what their approach is, and what kind of material they need during the fund-raising process. Following are some basic but by no means complete rules of the road, along with some things that you shouldn’t do. In this chapter, we cover topics like Do or Do Not; There Is No “Try”, Determine How Much You Are Raising, Fund-Raising Materials, Due Diligence Materials, Finding the Right VC, Finding a Lead VC, How VCs Decide to Invest, and Closing the Deal. Hopefully we are whetting your appetite for the tasty morsels to come. On day two of our romp through the table of contents of Venture Deals: Be Smarter Than Your Lawyer and Venture Capitalist, we cover the various players involved. While it might seem like there are only two players in the financing dance—the entrepreneur and the venture capitalist—there are often others, including angel investors, lawyers, and mentors. Any entrepreneur who has created a company that has gone through multiple financings knows that the number of people involved can quickly spiral out of control, especially if you aren’t sure who actually is making the decisions at each step along the way. The experience, motivation, and relative power of each participant in a financing can be complex, and the implications are often mysterious. Let’s begin our journey to understanding venture capital financings by making sure we understand each player and the dynamics surrounding the participants. In Chapter 1, we describe and discuss the entrepreneur, venture capitalist, angel investor, syndicate, lawyer, and mentor. Every book, framework, and deal needs a place to start – knowing the players is the one we thought was best. Every day for the next two weeks we’ll give you a small taste of our new book Venture Deals: Be Smarter Than Your Lawyer and Venture Capitalist by giving you the overview of each chapter along with the titles of each subsection. Of course, our goal with this is to be good book salesmen and encourage you to buy the book by teasing a little about the content. So, if you are already a believer, go buy the book now. Otherwise, here’s some background from the Preface on why we wrote the book. One of the ways to finance a company is to raise venture capital. While only a small percentage of companies raise venture capital, many of the great technology companies that have been created, including Google, Apple, Cisco Systems, Yahoo!, Netscape, Sun Microsystems, Compaq, Digital Equipment Corporation, and America Online (AOL) raised venture capital early in their lives. Some of today’s fastest-growing entrepreneurial companies, such as Facebook, Twitter, LinkedIn, Zynga, and Groupon, were also recipients of venture capital. Over the past 17 years we’ve been involved in hundreds of venture capital financings. Six years ago, after a particularly challenging financing, we decided to write a series of blog posts that would demystify the venture capital financing process. The result was the Term Sheet Series on Brad’s blog, which was the inspiration for this book. As each new generation of entrepreneur emerges, there is a renewed interest in how venture capital deals come together. We encounter many of these first-time entrepreneurs through our activities as venture capitalists at our firm Foundry Group, as well as our involvement in TechStars. We are regularly reminded that there is no definitive guide to venture capital deals and as a result set out to create one. In addition to describing venture capital deals in depth, we’ve tried to create context around the players, the deal dynamics, and how venture capital funds work. We’ve tossed in a section on negotiation, if only to provide another viewpoint into the brains of how a venture capitalist (at least the two of us) might think about negotiation. We also took on explaining the other term sheet that fortunate entrepreneurs will encounter—namely the letter of intent to acquire your company. We’ve tried to take a balanced view between the entrepreneurs’ perspective and the venture capitalists’ perspective. As early stage investors, we know we are biased toward an early stage perspective, but we try to provide context that will apply to any financing stage. We’ve also tried to make fun of lawyers any chance we get. We hope you find this book useful in your quest to creating a great company. 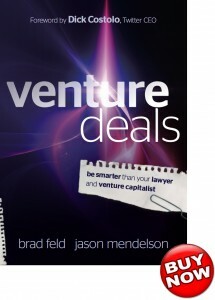 It wasn’t supposed to be out for another week, but real copies of Venture Deals: Be Smarter Than Your Lawyer and Venture Capitalist have started showing up in people’s hands. It feels great to have the thing finally ship. Several of our friends have already put up reviews on their blogs. Take a look at what Fred Wilson and Matt Blumberg have to say. In addition to a nice review, Matt played an important role in the book as he took on “The Entrepreneurs Perspective” and wrote a bunch of sidebars which give the entrepreneurs view on the perspective that we had on various issues. You’ll start to see regular posts again on this blog. Over the next few weeks we’ll give you a summary of each chapter along with some special bonus material. We’ve also started up a VC Blog Post of the Day – now that there are 9,415 VC bloggers, we’ll read all the posts and pick out the best one each day – so you don’t have to. Of course, if you are a VC and don’t think we are reading your posts (everyone we read is listed in the right sidebar under VC Bloggers), drop Brad an email and he’ll add you to the list.